One of the most ancient fishing techniques is spearfishing. It started as using sharpened sticks to hunt for fish in the water and has evolved into a popular modern-day sport. Spearfishing is a popular activity because it gets you submersed into the water and actively hunting down your fish. 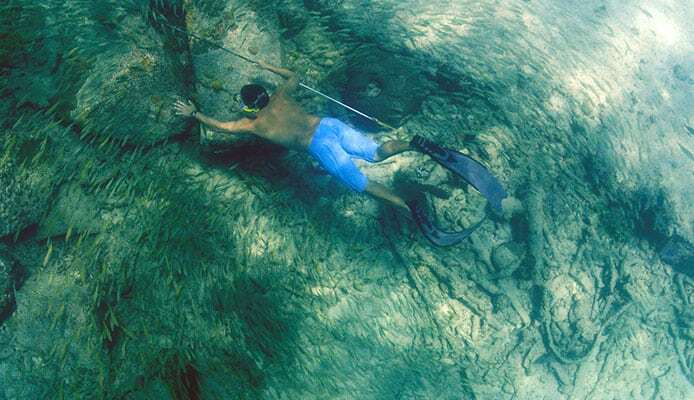 With modern spearfishing, fishermen use spear hunting equipment that has been specialized for the sport. There are spearguns, spearfishing wetsuits, and spearfishing masks that have all been designed with the sport in mind. However, one piece of specialized equipment that honors the ancient traditions, is a pole spear. A pole spear takes the traditional aspects of spearfishing but updates it with modern designs. Instead of using a sharpened stick, you will use a specialized pole spear. When you find the best time of day to go fishing, you can snorkel, scuba dive, swim, or wade into water when you spearfish. 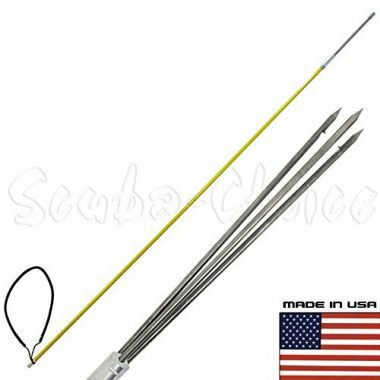 With the popularity of spearfishing comes a large market of pole spear designs. It can be overwhelming to choose just one, but we have made a guide to help you determine the best pole spear model for you. 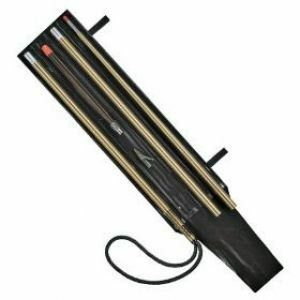 This top rated travel pole spear is 5 feet in length and is made of fiberglass material. It has a 3 prong paralyzer tip with barb and a stainless steel 12 inch long and an 8 millimeter diameter thread. It comes with a black rubber sling and a carrying bag. The pole is broken down into three parts. Two parts are 24 inches in length and the final part is the 12 inch paralyzer tip. 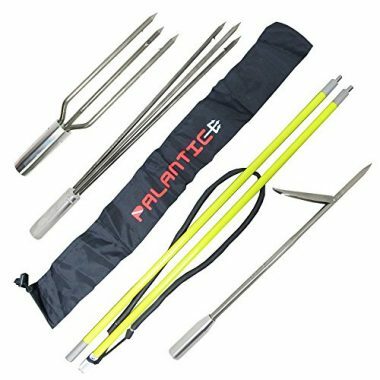 This is one of Scuba Choice’s best selling items because it comes with everything you need to get starts, regardless if you are a beginner or expert spearfisherman. 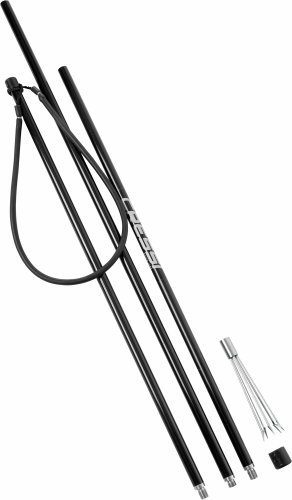 This spearfishing pole is 5 feet in length and has a durable fiberglass construction. It has a 3 prong paralyzer tip with barb that is placed on a stainless steel 12 inch long thread. It comes with a black rubber sling and bag. The pole is broken down into three parts. Specifically, two pole parts that are 24 inches long each and the 12 inch long tip. The paralyzer has two barb tips. A 12 inch single barb tip and a 6 inch Lionfish tip. This three piece design has a complete length of 6 feet 7 inches and breaks down into 27.5 inches for easy storage and travel. It is a high strength, corrosion resistant, and made of anodized aircraft aluminum. The connecting joints are supported by recessed flush screws on the connectors that make for a smooth release. It includes three interchangeable sections for 3 different pole spear lengths and one 5 prong cluster paralyzer tip. Each prong has “sure grip” prongs. It also comes with one full length MAKO Spearguns Latex Power Band. When this top rated travel pole spear is fully assembled it is 6 feet in length. Collapsed down, it has a length of 26 inches. It includes a barbed paralyzer and a Wing Rock point tip. A black surgical rubber sling is also included, so that you can launch your spear. The sling allows for power variation and is easily replaceable. It has tempered aluminum poles that is anodized in hard gold. Pole spear reviews call this pole a “great spear” and “absolutely awesome”. This Cressi Pole Spear is easy to use and ideal for catching fish. It has 3 pieces that are assembled together to deliver maximum versatility of use. When the three pieces are fully assembled, they are 6 feet in length. The paralyzer tip is another 6 inches long, which makes this a 6 foot 6 inch pole in total. It is made of thick-walled aluminum with a durable construction and threaded joints for quick action and security. A 5 barbed prong with a cluster tip is included and is 7 inches long. The tip is made of durable and corrosion resistant metal. A carrying bag is also included with the purchase. This pole is not collapsible and is 6 feet in length. The pole itself is 5 feet long and the spear tip is 1 foot long. It is made of fiberglass and included a 3 prong paralyzer tip. A black rubber sling is also included in the purchase. The headhunter pole spears have consistent pole spear reviews that customers are happy and satisfied. This Pole Spear for Spearfishing by IST is 6 feet and 6 inches in length. It has an interchangeable tip and unscrews. It is broken down in to three parts with the longest part being just under 28 inches. It has a 3 pronged spear tip and a rubber sling is included in the purchase. Pole spear reviews state that this design is a “great value for introductory spearfishing” and a “very good spear for the price”. 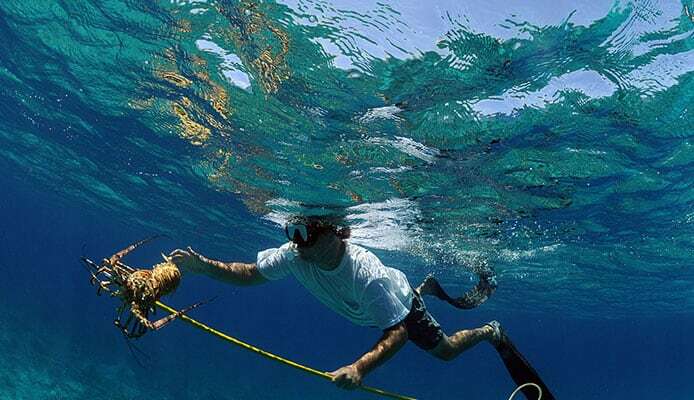 Beginners will love experiencing spearfishing, without spending a lot of money. When it comes to choosing a spearfishing pole, it is important that you consider a few key features before you make a purchase. There are a lot of different designs from carbon fiber poles spears and aluminum fiber pole spears to long and short pole spears. Even more confusing are all the different designs of tips that are used. By using our buying guide, you can get a sense of the best pole spear designs and which may suit your fishing needs. We also have answered some frequently asked questions, so you are prepared for your spearfishing trip and are able to find a top rated travel pole spear to take along with you. The first consideration you should make before purchasing a pole spear is the size of the pole. The size is determined by the length of the pole spear and they generally are available in a range of 4-8 feet long. However, there are some designs that can be modified to be up to 12 feet long. Pole spears with that much length are generally broken down into a couple pieces for easy portability. As you can imagine, the length of the pole determines how close or far away you will be from a target and can change the dynamics of how the pole reacts when it is thrown underwater. Both long and short poles have their pros and cons. Longer poles are mostly recommended for experiences divers. A longer pole spear allows the diver more gain in their reach and allows them to be further away from the target. Shorter poles are recommended for beginners or spearfishing in confined places because you can maneuver it more easily. There are many different tips that are available a spearfishing pole. Some tip designs include a paralyzer, single barb, and double barb. The tips of the poles will be either fixed or interchangeable. The type of fish and size of the fish that you are hunting will determine which tip is best to use. When it comes to choosing between fixed and interchangeable, it may help to consider your experience. If you are just getting started, a fixed tip can be a reliable way to learn the sport. Interchangeable tips allow you to choose any design that works with your spearfishing pole but may require expertise to use some tip designs. Most tip designs will have the availability to be purchased on both a fixed or interchangeable pole spear. The model of the tip should provide the information you need to determine if it will work with your pole spear and if it has the tip style or barbs that you prefer or need. Most designs will be made of a durable material. 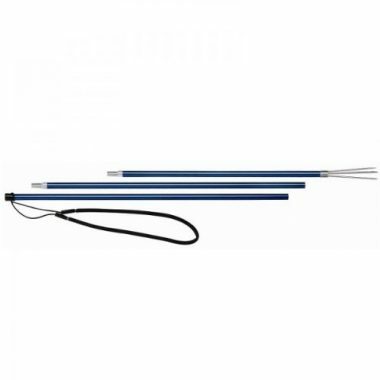 The two most popular materials are carbon fiber poles spears and aluminum fiber pole spears. There are also fiberglass designs, if you prefer that material. The material of your pole spear for spearfishing is important to consider because it will affect the weight of your spear, which in turn, affects the speed and stopping power of the pole when it is thrown in water. Aluminum is a heavier material, which means it will move slowly through the water, but has a high stopping ability. Carbon fiber are lighter and faster in the water, but still have a decent stopping power for smaller sized fish. If you can’t decide between the two, some designs are actually a hybrid and feature both aluminum and carbon fiber materials. You should choose the material of your pole spear based on the type of fish and size of fish that you are looking to hunt. The best travel pole spear will be broken down into pieces or sections. The pieces of the pole spear can then be attached together, often screwed together, to complete the pole length. Many companies will also include a travel or storage bag with your purchase, that can be used to carry the pole, tip, and rubber sling. A top rated travel pole spear will be able to be easily broken down to travel with, but won’t compromise it’s performance in the water. The construction of the pole will mostly be determined by the material that the pole spear is made out of. Carbon fiber pole spears are flexible and strong, whereas aluminum fiber pole spears are lightweight but durable. However, you want to ensure that the actual design of your pole spear is durable too. 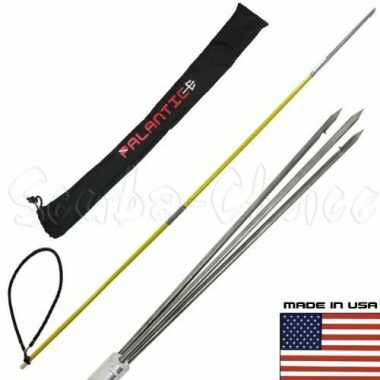 It would be frustrating to have a pole spear break while you are spearfishing, so you should ensure you find a design that has a solid construction, even if it is broken down into a few pieces for portability. Pole spears are actually easy to use, it is learning the technique that is hard. A pole spear doesn’t have anything to project itself, so you must throw it through the water, aiming at your target. It’s a straightforward and easy to use hunting tool. However, the length of the spear and the tip may determine how easy the pole spear is for you to use. For beginners, it’s best to have a shorter pole spear that they can learn the techniques on. Q: What is a pole spear? What are they used for? A: A pole spear is a weapon that is used to hunt for fish. The pole spear itself is used to hunt the fish. Fisherman throw the pole, using the elastic system, through the water to spear or pin a fish. It is important to note that spearfishing is mainly an underwater fishing sport. This means a pole spear will be used when you are snorkeling, scuba diving, swimming, or wading through the water and is the perfect time to bring along GoPros for fishing to capture unique footage. They come in various lengths and have various tip styles for the different types and sizes of fish that are hunt. Q: Do I need any special education before I use a pole spear? A: A spearfishing pole is projected by hand with an elastic band and is thrown through the water towards a target. It is a straight forward and self-explanatory hunting tool. Almost anybody can throw a spear. However, you will need education on the size of the spear and the type of tip in correlation to the type of fish and size of fish you would like to hunt. You will also need to be able to swim, because this is an underwater sport and having a pair of fishing shoes can save your feet if you need to walk along any coral reefs. It is useful to have a guide or experienced spearfisherman to help you get started in the sport. It’s not necessary that you need special education before using a pole spear, you could go out and try it on your own, but it can certainly help you, your accuracy, and the success of your spearfishing trip to have prior knowledge. Q: How to use a pole spear? A: A pole spear uses an elastic band that is stretched to provide momentum that is used to propel the spear. The band is stretched to the hand and kept in the crook of the thumb. When it is released, the spear is launched in the direction of the target. The size/length of your pole spear will determine the range you have at hitting a target. Longer pole spears have the best range, but for beginners it isn’t the first choice. A longer pole spear is harder to maneuver, and beginners have an easier time learning with a shorter spear. The technique of a pole spear is using your hand to guide the spear and make an accurate throw. You should get as close to the target as possible before taking a shot. Getting closer will give you more accuracy and a higher success rate. Many people like to observe fish for a while before they begin hunting. This allows them to hide themselves and make educated guesses on the fishes’ movement before they attempt to move in for a shot. The best pole spear will have you emerged in an underwater paradise as you hunt for a variety of fish. 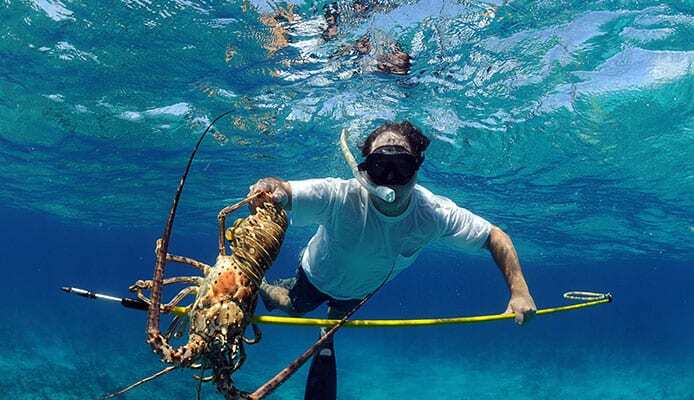 Spearfishing is an exciting sport and a top rated travel pole spear can inspire you to travel around the world in search of the best hunting grounds. Whether you are a beginner or experienced, you will need a spearfishing pole and it should be at the top of your fishing trip checklist. If you know exactly what you want and need, you can save time and money, which gets you out into the water faster! Do you own one of the pole spears that made it onto our list? Let us know how it has worked for your spearfishing needs in the comments sections below.